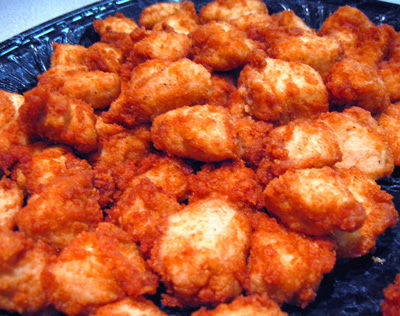 OK, so you live in a Chik-fil-a dead zone or maybe you just want to make your very own at home…Here ya go! This recipe is a must try! I recommend pairing with deep fried pickles! Whisk together egg, milk and pickle juice, and pour into a large ziplock bag or bowl. Add chicken pieces and marinate in the refrigerator for 2-4 hours. Combine flour, powdered sugar, salt and pepper in a large ziplock bag. Remove chicken from the marinade and add into the bag. Shake to coat the chicken completely. Test the oil by dropping in a bit of the flour mixture. If it sizzles, the oil is ready, if it pops, lower the temperature a bit. Gently place chicken pieces into the oil with tongs. Do this in 2 batches, as you don’t want to overcrowd the pan. Cook the chicken for 3-4 minutes, or until golden brown on one side. Turn the chicken over and allow to cook for 3-4 more minutes. Remove to a paper-towel lined plate. Heat the remaining oil and continue with the other half of the chicken pieces. Stir together the honey mustard dipping sauce ingredients, and serve with the hot chicken bites.